Women of Latin-American descent in Spain are reported to have high levels of labor force participation. At the same time little is known about the relationship between work and multigenerational living arrangements of these women in particular in times of economic crisis. In this paper we question how living arrangements are relevant for participation in the labor market among Latin American women of diverse origin with minor children. We are particularly interested in the role of multigenerational or extended households and aim to identify how labor force participation and living arrangements are related. 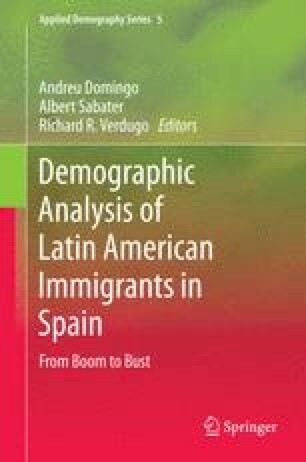 We use pooled data from the Spanish Labor Force Survey 2005–2012 and apply descriptive and multivariate analysis including detailed information on the individual and all household members. Paying attention to different dimensions of participation (having a job, number of hours worked etc.) allows us to identify different labor market strategies and their relation with living arrangements during a period of economic crisis. •¿“From complementariety to exclusion? A sociodemographic analysis of the impact of the economic recession on immigrant population” (Ref. CSO2011/24501), funded by the Spanish Ministry of Science and Innovation, National R + D + I Plan 2012–2014.